Looking for a horse barn or shelter that is built to last, strong, and affordable? The horse barns at Metal Carports are extremely strong, long lasting and are fully customizable! Why Should I Buy My Next Horse Barn From Metalcarports.com? Quality. Durability. Professionalism. Customizable Options. Our name may be “carports”, but our building designs are almost endless! 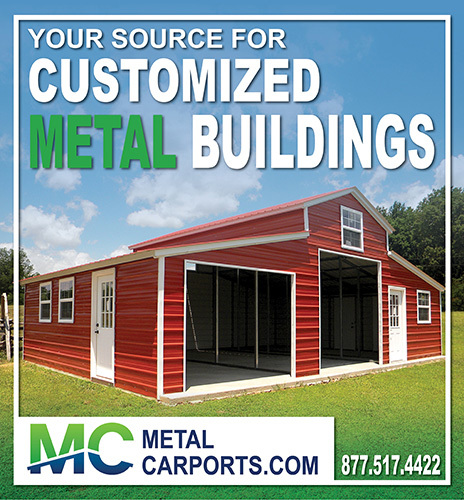 Our company, MetalCarports.com was was founded with one goal in mind, to provide high quality metal buildings with the best customer service possible. We provide top quality service from initial concept, financing options, order acceptance and approval, to installation. We are partnered with the largest metal carport manufacturer in the country, Eagle Carports, which has a BBB (Better Business Bureau) rating of A+. This enables us to provide a large coverage area with the quickest lead times in the industry. What Benefits Do Metal Barns Have To Offer? Ask anyone who has owned one of our barns and they will have a list of answers! Our metal barns withstand high winds, rain, snow, and horses don’t “chew” on them. Metal doesn’t offer the fire hazards of wood and metal is not something that insects like to eat! Resistant to flame, bugs (termite proof! ), chewing horses, and you don’t have to worry about “rotting wood”! In addition, you will love our fast and versatile installations— and the way our barns look beautiful for years and years without painting! Is It True That Metalcarports.com Will Get My Customized Barn Out To Me Fast? That’s right! As fast as possible without sacrificing one bit of the quality and customer service our clients love about us. With our very large inventory of available configurations- we just have to add in your customizable options. With our customizable options the possibilities are endless. Termite proof, our galvanized metal framing and pre-galvanized painted metal sheeting is sure to last for years and years to come. Is The Framing Actually Galvanized Steel? You bet and this is a huge selling feature that really sets our metal barns apart from the competition! Our galvanized steel framing is proudly made in Blyfiled Arkansas by Nucor. And our sheet metal is painted by Ternium in Shreveport LA. We have a dedicated and professional staff to walk you through the process of deciding which building will best fit your needs and your budget—but you can sleep better at night knowing whatever options you go with— you have the security of galvanized steel framing! What Is Galvanized Steel and What Are The Advantages? Galvanization or galvanizing is the process of applying a protective zinc coating to steel or iron, to prevent rusting. Galvanization is important because it provides long-lasting protection for steel and iron products. All of our steel has a top of the line protective zinc coating to prevent premature rust and offers an outstanding corrosion Ph. When you purchase one of our metal structures you will benefit from lower maintenance and repair costs because of its special properties. How Will These Steel Barns Hold Up To Wind and Weather? We are glad you asked! You may be ‘blown away” by tough storms, but your barns and shelters will stand strong! Fact: With all of our metal barns and structures we offer certification packages. The lowest certification we carry is 35 PSF snow and 140 MPH winds. For our coastal regions or anyone in a high wind area we offer up to 170 MPH wind certifications. If you are in a heavy snow area we still have you covered, we offer up to 65 PSF snow certification. We have generic stamped engineered drawings available upon request. We also have site specific engineered drawings available at an additional cost. No matter your area our buildings can withstand the elements and let you rest easier knowing your items are covered. Is It True That Delivery And Installation Is Free? Fact, On all new purchases of any of our buildings we do offer free delivery and installation on your already prepared level and clear foundation. Please note: If your land is unlevel or you have obstructions in the way, you will have an additional labor fee on top of the cost of the building. However, do not worry just let us know in advance and we will let you know what the additional charges are so you will not have any surprises. Is My Barn Fully Customizable? You bet! All of our metal barns come with standard option packages. However, don’t let that deter you, we can add or take away any options you would like on your building. Even our sizes are customizable. If you do not see the exact size or all the options you are looking for just give us a call or send an email and one of our expert customer service representatives will assist you in getting the prices you need to get exactly what you are looking for. We can cut windows, add doors— just tell us what you want and we’ll make it happen! How Long Does It Take To Get My Metal Barn? All lead times vary by the city and state for the building site address. Several of our installation areas are currently running between five to ten business days starting the date of purchase weather permitting. If you would like to check the time frame for your area please contact us on our toll free line or send an email with your zip code for the installation address and we will be glad to give you the lead times in your area. What Are The Most Popular Barn Packages? You will love our huge Horse Barn selection, quality, durability and affordable pricing! 42’ Vertical Mare Hotel Or Outdoor Horse Barn! We have barns in all sizes, but this is a very popular one! The 42’ wide Horse Barn has a center building width of 18’. The leg height will be 12’ with a 3’ brace standard on every leg for additional strength. You will have a 12’ wide lean-to on each side of the center structure with 8’ leg height at the lowest point of your building and our 2’ braces package on every leg. You will enjoy the added coverage our gable ends offer on each end of the building on the center section and lean-tos as well. Depending on the installation area your building will be 5’ on center which means every five feet you will have tubing for the legs. This is also one of our more popular barns for horse properties with several horses. The 50’ wide Eagle Barn has a center building width of 26’. The leg height will be 11’ with a 3’ brace standard on every leg for additional strength. You will have a 12’ wide lean-to on each side of the center structure with 8’ leg height at the lowest point of your building and our 2’ braces package on every leg. You will enjoy the added coverage our gable ends offer on each end of the building on the center section and lean-tos as well. Depending on the installation area your building will be 5’ on center which means every five feet you will have tubing for the legs. Don’t You Deserve To Get The Barn Of Your Dreams Today? Give Us A Call and We’ll Make It Happen! You will love the power, beauty, durability and safety that your Metalcarports.com metal barn has to offer. Our staff is here to ensure you get exactly what you want for the most affordable price possible. You’ll be amazed at the beauty and proud to show this barn to your family and friends—and you’ll love the peace of mind knowing that your horses are beautifully and safely housed. Call us today—we have a barn with “your name on it”—just waiting for that call!